"My ex-mother-in-law used to make this for me. It's not a milk custard type, and it's not like a regular rhubarb pie. It's just fantastic! Fresh or frozen rhubarb may be used." Beat egg yolks to a thick froth. Gradually beat in the sugar, flour, and melted butter or margarine. If using fresh rhubarb, use 3 tablespoons flour; if using frozen rhubarb, only use 2 tablespoons. Stir in rhubarb pieces. Dump rhubarb mixture into an unbaked, chilled pie shell. Cover filling with top crust. Flute and vent the pie. Bake on bottom rack of oven at 425 degrees F (220 degrees C) for 10 minutes, then at 375 degrees F (190 degrees C) for 30 minutes. Cool somewhat before cutting. I only added 3/4 c. of sugar, but it was still way too sweet. I tried the rhubarb pie from allrecipes that calls for 1 1/3 c. sugar per 4 cups of rhubarb and that ratio was much better. This pie is so good! It's just like my mom used to make...just one comment - make sure you let it cool completely before cutting it or it will be too runny. This pie was awesome!! It had a great sweet yet tart flavor. I will definitely use this recipe again. I added a cup more of rhubarb to fill in the pie plate a little more. 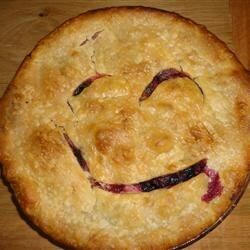 I love rhubarb pie and this one is excellent! This is like my Mother used to make,and I have been looking a long time for it!